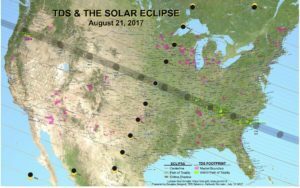 Various TDS markets in Oregon, Kentucky, Tennessee, Georgia, and South Carolina will be in the direct path of the eclipse, or the “path of totality,” where the moon will completely block the sun for about two to three minutes. Being as close to the center of the dark band will give viewers the best sights of the eclipse. Communities within the path of totality are preparing for a major influx of visitors during the eclipse. The City of Bend is estimating 190,000 visitors. In preparation for the influx, the State of Oregon created a 23-page document outlining an emergency plan for before and after the phenomenon. Many communities are encouraging residents and visitors to prepare as they would for a winter storm or other types of emergencies including stocking up on food and gas at least a week before the event. In addition, residents who will be hitting the road, should plan to be stuck in traffic for long periods of time. As far as safety goes, individuals everywhere should never look directly at the sun, even during an eclipse. Various websites are selling eclipse-certified glasses, and vendors will be selling them on-site at some of the most popular viewing venues. While TV service shouldn’t be affected by the eclipse, the massive influx of people may cause lots of internet traffic, and local cell towers will likely notice a spike as well. This isn’t a direct effect of the eclipse, but rather consequences of the number of internet users in the area. 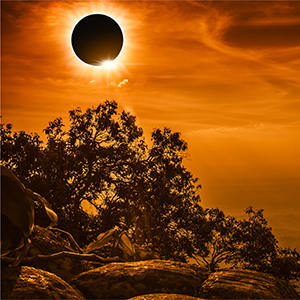 In Oregon, the eclipse will start at 9:06 a.m., with totality at 10:19 a.m. in Madras (located in Central Oregon and almost directly on the path), the eclipse will end at 11:30 a.m.
Madras is the feature city in the Science Channel’s upcoming special, The Great American Eclipse. Zolo Media of Bend, Ore. partnered with Oregon Solarfest to promote and televise the coming eclipse on local channels. BendBroadband is reducing the number of installs that day to help keep the roads clear for travelers and emergency response vehicles. BendBroadband is working closely with the local sheriff’s department to supply internet connectivity during the week. The company has also developed a contingency plan in case cell towers stop working and, if the need arises, bringing in additional field service technicians the Sundays before the eclipse. Around noon, the eclipse will start in the Salem Telephone Company area in Kentucky, with totality occurring at 1:25 p.m. In Tennessee, the Mt. Juliet, Tellico Plains, and Farragut areas will view the eclipse next with the Blue Ridge Telephone area in Georgia immediately following. Some of the last communities that will see the eclipse in the United States are the Williston, Norway, St. Stephen and Lewis River telephone companies in South Carolina. In Knox County, Tennessee, the district is closing all of its schools for the eclipse. Want to get the “perfect” picture with your phone? Read this story. Remember, even if you are not in the path of totality during the eclipse, a partial eclipse will still be visible if weather permits.